The self-paced Basics of Spare Parts Management training course provides you with a general understanding of spare parts inventory management, teaches you how to identify critical spares, and how to determine the most appropriate ReOrder Point (ROP) and ReOrder Quantity (ROQ). Please note that this course is delivered via the course modules online. If you want a ‘classroom’ experience, we also provide this course in an instructor-led format. Click here to read more. The characteristics that differentiate spare parts inventory from other types of inventory. The 5 common supply chain techniques that should not be used with spare parts inventory. How spare parts management fits into the big picture of operations management. The 5 key financial principles for spare parts management. How to identify and interpret the key financial reports associated with spare parts management. The 7 questions that need to be asked before deciding whether or not to stock an item in inventory. How to determine the requirements for selecting and stocking spare parts for new capital equipment (first time buy). How to identify critical spare parts. How to determine appropriate re-order points (ROP) and re-order quantities (ROQ) – complete with exercises to test your know-how. The self-paced Basics of Spare Parts Management training course is for the people engaged in the day-to-day operational decision-making and who don’t yet need the higher level tactical information in our Advanced program. This course is for companies that keep spare parts to support the maintenance and operations of their own assets and equipment. This is often referred to as MRO. This course allows you to study at your own pace and you have up to 3 months to complete all the modules. We recommend a minimum time commitment of 2 hours per week. Studying at this rate will enable you to complete the training within the allocated time and leave some time for review. Of course, if you have time, you can work through the content faster than that. The choice is yours. Online course-related coaching and tutorial support is provided via our exclusive online coaching function. Each module includes an online quiz. 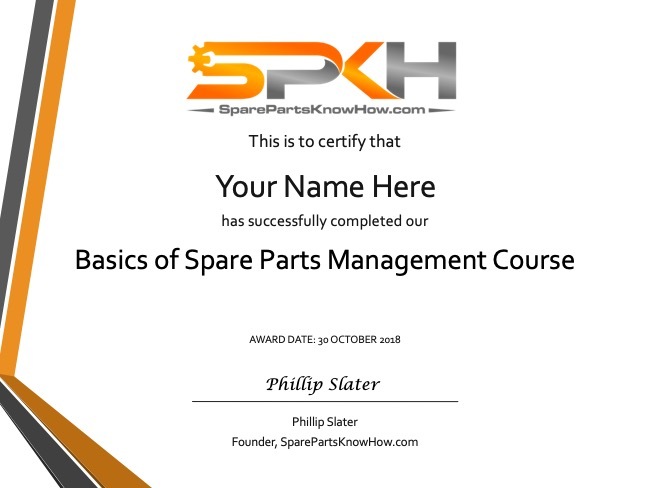 Successfully completing each of the online quizzes leads to the award of our Basics of Spare Parts Management Course certificate. We set the ‘pass’ level for these quizzes at 80%. Please note that the course certificate will be forwarded to your registered email address within 7 days of course completion. Payment is accepted via credit card and PayPal. For other enrollment options please visit our How to Enroll page. Which Type of Spare Parts Management Training is Right for You? Copyright © 2019 IPIAIGHT PTY LTD.